A new Working Paper, 2013-WP-02, "Globalization and Inflation: A Swiss Perspective" by Networks' Research Scholar and former Director of Research, John A. Tatom is now available from ourWorking Papers page. The paper explores the role of globalization, if any, for inflation, particularly in Switzerland, one of the smallest and most open economies where the globalization hypothesis should be most relevant, but where inflation historically has been among the lowest in the world. Indiana State University student Andrew Feutz posed a question to a class of local high school students: a new company coming to a town would emit waste and be harmful to the community, but it would bring a lot of jobs and the company has a reputation of generously giving scholarships to local college-bound students. Feutz then asked the class: should the company be allowed in the town? Feutz was part of a group of four Indiana State University students who taught local high school students about business ethics through case studies that were presented during the classes at Terre Haute North Vigo High School. The project started when Kim LaGrange, coordinator of the Meis Student Development Center and instructor in Indiana State's Scott College of Business, and Abe Nasser, teacher at Terre Haute North, discussed a collaboration that the college students could present to Nasser's business class. Networks Scholarships are for students in any business major who intend to pursue a career in the in financial services industry. Students participate in the Networks Professional Development Program. 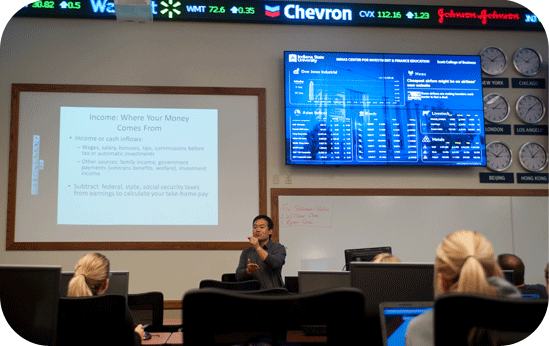 For more information about the financial services industry and career options, as well as the professional development program see the link below. Applications for these scholarships must be received by December 1, 2013. While much of the nation’s attention was focused on the rocky implementation of state and federal insurance exchanges, Networks Financial Institute at Indiana State University convened some of the most influential thought leaders on health care policy to broadly assess the impact of the historic Affordable Care Act (ACA). During "The Big Bang for the Affordable Care Act: The End of Health Care Financing as We Know It?" forum, policymakers, researchers and Massachusetts Institute of Technology Professor of Economics Jonathan Gruber – a key adviser to the Obama administration during development of the ACA – examined how the Act will impact insurers, health care providers, employers and consumers. A new Policy Brief, 2013-PB-07, "The Past, Present and Future of U.S. Health Care Reform" by Jonathan Gruber, Professor of Economics at the Massachusetts Institute of Technology, is now available from our Policy Briefs page. On Sunday, October 27, Networks Scholar and accounting major Jessica Weesner vied with 11 other women to become Miss Indiana State University. Jessica will represent Indiana State at Miss Indiana in June 2014 where she will vie for the right to represent Indiana at Miss America. 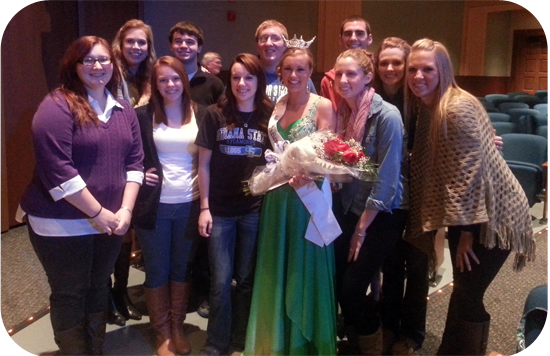 Miss Indiana State University has been in existence since 1958 and Jessica is the 31st woman to hold the title. The Affordable Care Act is almost upon us. In March 2010, President Obama signed comprehensive health reform, the Patient Protection and Affordable Care Act (ACA), into law. The law is supposed to make health care more accessible and affordable for most Americans. While some provisions of the law have already taken effect, many more provisions will be implemented in the coming years. ACA Enrollment begins October 1, 2013 for coverage beginning January 1, 2014. Networks Financial Institute will host "The Big Bang for the Affordable Care Act: The End of Health Care Financing as We Know It?" in Indianapolis on October 18, 2013, at the Columbia Club. A new Policy Brief, 2013-PB-06, "How Obamacare Will Re-Shape the Practice of Medicine" by Scott Gottlieb, physician and Resident Fellow at the American Enterprise Institute in Washington, DC. is now available from our Policy Briefs page. A new Policy Brief, 2013-PB-05, "ObamaCare: Rocky Politics, Stable Coverage" by David Kendall, Senior Fellow for Health and Fiscal Policy at Third Way is now available from our Policy Briefs page. Jack Tatom, Networks' research consultant was interviewed by Terri Stacy of Indianapolis radio station WIBC (FM 93.1) about the upcoming Affordable Healthcare Act Forum. You can listen to the audio recording on StateVids. The Affordable Care Act’s seismic effects on the nation’s health care industry, including how people get insurance, its availability and cost, will be discussed at an Oct. 18 forum at the Columbia Club in Indianapolis. Networks Financial Institute in the Scott College of Business at Indiana State University will host "The big bang for the Affordable Care Act: The end of health care financing as we know it?" The forum will provide insights about the implementation of the law, which is sometimes referred to as Obamacare, including the ACA’s unintended consequences and potential regulatory responses. The forum will come just as ACA enrollment began on Oct. 1, with coverage starting on Jan. 1. Hoosiers are more likely to lack health insurance than Americans in general, according to a pair of reports issued last week by the U.S. Census Bureau. In 2012, 16.4 percent of Indiana residents were without health insurance, compared with 15.4 percent for the U.S. as a whole, according to the latest data. That higher percentage may be attributed to, in part, the higher unemployment rate in Indiana. The U.S. rate in July was 7.4 percent, compared with 8.4 percent for Hoosiers. Private insurance coverage is tied to unemployment because many Americans — about 58 percent — have health insurance through their jobs. "The big question is jobs," said Curtis Skinner, director of family economic security for the National Center for Children in Poverty, an anti-poverty research center in New York. Job creation "really is the biggest and best anti-poverty policy." Jack Tatom, consultant for the Networks Financial Institute in the Scott College of Business at Indiana State University, agrees that there is a close link between private insurance coverage and employment. Overall, the most recent Census figures show only a small increase in the number of Americans with health insurance. In 2012, 48.6 million Americans had health insurance, compared with 48 million in 2011, the figures show. A new Policy Brief, 2013-PB-04, "Should Financial Regulators Engage in International Policy Coordination?" by Networks' Senior Fellow, David VanHoose is now available from our Policy Briefs page. 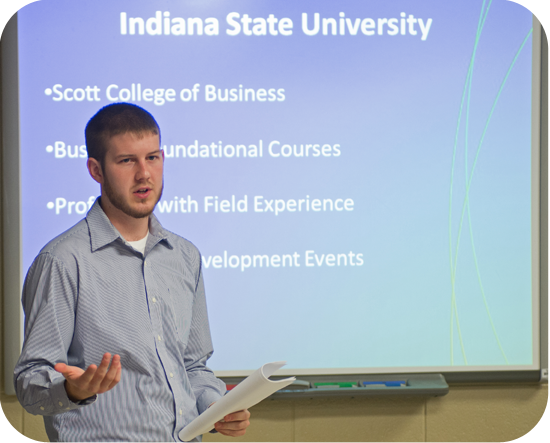 Indiana State University student Mitch Wasmund was delighted to discover that the theories and lessons he was learning in the classroom are used by professionals across the business world - including a global insurance giant based in Europe. Wasmund was part of a group of 19 Indiana State University students who traveled to Zurich, Switzerland, and Munich, Germany, on a 10-day trip to gain more perspective about international business practices. Networks Financial Institute's (NFI) Professional Development Program's annual student trip includes site visits, tours and presentations from professionals in a variety of fields. 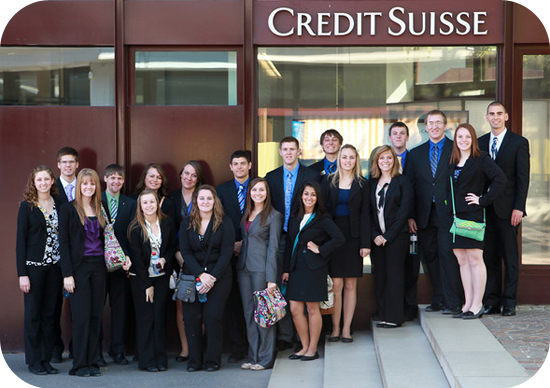 Students on this year's trip visited with executives from Zurich Insurance and Credit Suisse to learn more about how the respective multinational businesses function. The Gongaware Center in the Indiana State University Scott College of Business announces the 2013 class of Gongaware Scholars. Freshmen Ben Weber, Meagan Stenger and Zach McCoy are recipients of the scholarship, which includes a $3,000 professional development account, a laptop and participation in Networks Financial Institute's (NFI) Professional Development Program. Stenger and McCoy also received full in-state tuition through the program; Weber received a full in-state tuition award to attend Indiana State through the 21st Century Scholars program. "The Gongaware Scholars program is a tremendous opportunity for students to develop as professionals by participating in professional conferences, internships, workshops and events hosted by the center," said Rebecca Wray, interim director of the Gongaware Center in the Scott College of Business at Indiana State. "Graduates of the program enjoy 100 percent job placement and are well-prepared to have successful careers in the insurance and risk management and financial services industries." A local student has received the prestigious Networks Financial Institute (NFI) Scholarship to attend Indiana State University. Bram Blackwell, a Jersey Community High School graduate from Dow, received the award that includes full in-state tuition for four years, a $3,000 professional development account and a laptop. Scholarship recipients also will be a part of Indiana State’s NFI Professional Development Program, which provides the scholars an award-winning, four-year curriculum designed to cultivate leadership, management, teamwork and career skills. Scholars also receive access to corporate mentors, internships and travel opportunities. "These are smart students. They can get scholarships to any of a number of universities," said Michelle Reeson, assistant director for the NFI Professional Development Program. "They need something beyond just the scholarship, and that’s what the Networks Professional Development Program can do for them." Networks Scholars are required to complete internships and regularly attend educational seminars hosted throughout the year. They also organize events and programs on campus and in the community. "These students are 10 feet ahead of many other graduates hitting the job market when they graduate," Reeson said. "Over half of the last senior class of scholars held offers or had accepted jobs by December of their senior year, and that was largely due to the fact that they had worked a number of internships" and taken advantage of other professional opportunities. Eight incoming Indiana State University students will comprise the Networks Scholars program's Class of 2017. The first-year students will receive the prestigious Networks Financial Institute (NFI) Scholarship, which includes full in-state tuition for four years, a $3,000 professional development account and a laptop. The students also will be a part of the NFI Professional Development Program, which provides the scholars an award-winning, four-year curriculum designed to cultivate leadership, management, teamwork and career skills. Scholars also receive access to corporate mentors, internships and travel opportunities. "These are smart students. They can get scholarships to any of a number of universities," said Michelle Reeson, assistant director for the NFI Professional Development Program. "They need something beyond just the scholarship, and that's what the Networks Professional Development Program can do for them." Networks Scholars are required to complete internships and regularly attend educational seminars throughout the year. They also organize events and programs on campus and in the community; juniors in the program plan and host the annual Ethics and Social Responsibility Conference that takes place at Indiana State each spring. Named for Alan Rankin, the university's seventh president who served from 1965-1975, the awards recognize outstanding seniors who have demonstrated dedicated membership and leadership in campus organizations and in the community. Recipients must also have a cumulative grade-point average of at least 3.25 on a 4.0 scale. The 2013 Rankin Award recipients, who will be recognized during ISU's spring commencement, are Kay Brown of Avon, Andrew Graman of Bruceville, Katelynn Moats of Terre Haute and Kylee Thacker of Brazil. Each year the scholars in the Networks Professional Development Program review the year and receive their awards. 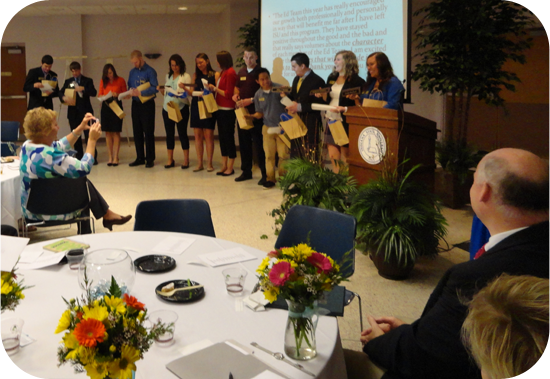 This year the event was held in Dede II of the Hulman Memorial Student Union on April 18, 2013. Like clockwork, Indiana State University graduate Joe Evelo regularly provides monthly updates to the first client he signed up when he embarked on his financial investment career more than 35 years ago. These updates reflect the consistency that led Evelo through economic booms and busts and billions of dollars in financial transactions to become one of the top financial advisors in the nation. Evelo returned to his alma mater to speak at the eighth annual Ethics and Corporate Social Responsibility Conference. During his presentation, the Terre Haute native tapped into his experiences and insights to provide lessons to Indiana State students and community business leaders on what it takes to be successful in the financial services industry and life in general. 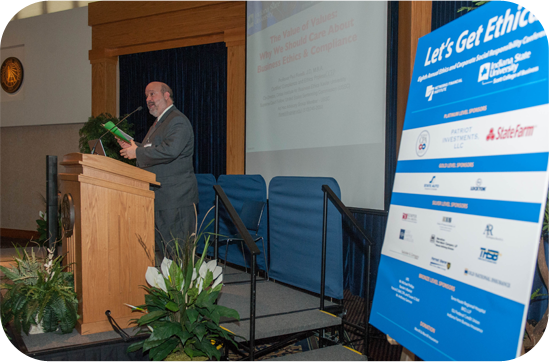 Photos taken at the 2013 Ethics and Corporate Responsibility Conference are now available from Indiana State University's Smugmug pages. The Working Paper 2011-WP-21 "U.S. Monetary Policy in Disarray" by John A. Tatom has been revised and is available from our Working Papers page. A group of Indiana State University insurance and risk management students will be receiving some major support next year. Nine students received scholarships from the Spencer Educational Foundation, an organization dedicated to funding educational opportunities for risk management and insurance students. Eight students received the $5,000 Spencer Educational Foundation General Fund award for undergraduate students, while Jaclin Huxford, senior insurance and risk management major from Clinton, received the foundation's $10,000 graduate student award. That award will help when Huxford begins pursuit of an MBA in the fall. Nearly half of U.S. high school students say they do not know how to establish good credit, according to new research released today by EverFi, Inc., the education technology company that teaches, assesses, and certifies students in critical skills including financial literacy. April is Financial Literacy Month, and a survey of high school students between the ages of 13 and 18 revealed that the state of financial literacy among the nation's youth is grim. The top staff official of the Property Casualty Insurers Association of America is warning the industry that reauthorization of the Terrorism Risk Insurance Act will be an "uphill climb" in this Congress. At the same time, the top staffer at the American Insurance Association acknowledged that "in the current economic and political climate, renewal will be tough." However, she said that that the industry and policyholders are organized and she is optimistic that, ultimately, TRIA will be reauthorized in some form. While the battle over the budget deficit, gun control and immigration grab the headlines coming out of Washington, an equally intense debate is underway over insurance regulation. As noted by a Congressional Research Service (CRS) official at a congressional hearing last month, insurance has been regulated by the states for more than 150 years. The big question is not whether that will change; it will certainly have to. The prestigious 9th Annual Insurance Public Policy Summit took place in Washington D.C. on March 20, 2013. Networks Financial Institute's Annual Insurance Public Policy Summit is one of the most anticipated events in Washington, DC due to the insightful and in-depth information delivered each year. The insurance regulatory system is evolving and there is still significant uncertainty as we await the international and domestic decisions on capital requirements, determinations of their cross-border equivalence, and decisions by the Financial Stability Oversight Council about the criteria for insurance companies to be classified as systemically important and the additional burdens that would entail. We continue to await the Federal Insurance Office’s Congressionally-mandated report to Congress on the state of regulation of the industry. Over 125 individuals representing various segments of the insurance industry were in attendance to hear the latest developments for the industry. Two new Policy Briefs have just been published. "Systemic Risk and Regulation of the U.S. Insurance Industry" by J. David Cummins and Mary A. Weiss and "International Capital Rules: Harmonization, Conflict or Competition" by Martin F. Grace are now available from our Policy Briefs page. The keynote speaker for the 2013 Ethics and Corporate Social Responsibility Conferenceorganized by Networks scholars and to be held on April 3, 2013 has been announced as Paul Fiorelli who is the co-director of the Cintas Institute for Business Ethics at Xavier University. You can read more about Professor Fiorelli on the Cintas Institute website. For more information on the conference see our Ethics Conference pages. Two key congressional leaders from opposite sides of the aisle will be among those providing public policy insights for the insurance industry at a summit in Washington, D.C, today. Sen. Jack Reed, D-R.I., and U.S. Rep. Blaine Luetkemeyer, R-Mo., will speak at Networks Financial Institute’s ninth annual Insurance Public Policy Summit at the Ronald Reagan Building and International Trade Center. The summit, with a theme of "Navigating U.S. and International Cross Currents," will feature policy, industry and research experts discussing the latest analysis and updates on a variety of areas affecting the insurance industry. A new Policy Brief, "Why Fixing the "Shadow Banking" Sector is Esential for the U.S. Housing Market" by R. Christopher Whalen is now available from our Policy Briefs page. Two key congressional leaders from opposite sides of the aisle will be among those providing public policy insights for the insurance industry at an upcoming summit in Washington, D.C.
Sen. Jack Reed, D-R.I., and U.S. Rep. Blaine Luetkemeyer, R-Mo., will speak at Networks Financial Institute's ninth annual Insurance Public Policy Summit on March 20 at the Ronald Reagan Building and International Trade Center. The summit, with a theme of "Navigating U.S. and International Cross Currents," will run from 8 a.m. to 2 p.m. and feature policy, industry and research experts discussing the latest analysis and updates on a variety of areas affecting the insurance industry. A new Working Paper, "The Pronounced Impact of Macroeconomic Stress on the Financial Sector: Implications for Real Sector Growth" by M. Kabir Hassan & William J. Hippler, III is now available from our Working Paper page. We explore how our growing understanding of the cognitive development process will affect the way we approach financial literacy initiatives in the United States with experts in the fields of education, public policy, and human development. Believe it or not, but the seeds for our financial performance during adulthood are actually sown in the first few years of our lives. It seems that if the right cognitive building blocks aren’t put into place before we’re old enough to even differentiate a credit card from a debit card, we’re far less likely to make sound financial decisions when there’s actually money on the line. The most important concept in play here is what’s known as "emergent literacy." The basic idea is that the way we understand and perceive things is based on a combination of experience and direct instruction that builds on itself over time. What our parents teach us as little kids affects how we comprehend things when we first go to kindergarten, which in turn affects how we do in first grade, and so on. Ultimately, our elementary school background impacts middle school and that impacts high school and that impacts any higher forms of education that we pursue and/or our place in the workforce. A white beard, tri-corner hat and ruffled collar underneath a blue jacket isn't the typical attire for Indiana State University junior Stephen Borkowski. But the clothing, reminiscent of 18th century America, set the young man apart last weekend as a famous Founding Father. 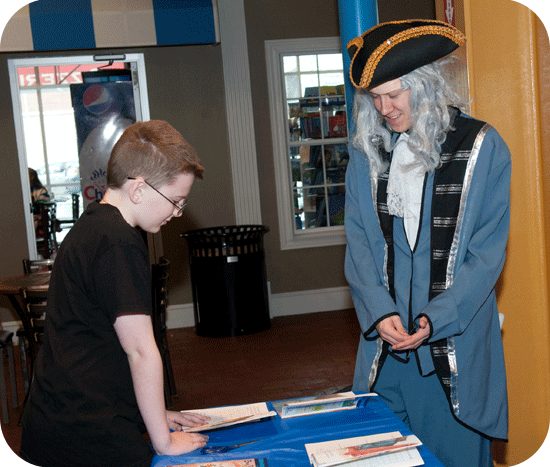 Dressed as Benjamin Franklin, Borkowski was one of the stars of the Terre Haute Children Museum's Ben Franklin Birthday Bash. The event served as a preview day for Go Figure's "Focus on Fitness" series, a four-week, hands-on math encouragement program aimed at third through fifth graders. 15 ISU volunteers, including those from ISU's department of kinesiology, recreation and sport management, the Networks Scholars program, the ISU nursing program and the Arnold Air Society at ISU helped make the event possible. The prestigious 9th Annual Insurance Public Policy Summit will take place in Washington D.C. on March 20, 2013. Networks Financial Institute's Annual Insurance Public Policy Summit is one of the most anticipated events in Washington, DC due to the insightful and in-depth information delivered each year. With the speakers in place for the 9th Annual Summit, register today as it's sure to be an event you won't want to miss.